Script writers: Nikulin L.; Aksenova I. Film about hereditary diseases of children, for medical students. The film tells about a number of hereditary eye diseases and injuries in childbirth. 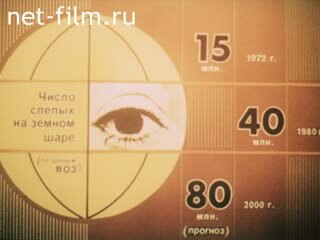 The film shows the Children's Republican Hospital, Diagnostic Center, a boarding school for the blind and visually impaired children, kindergarten and specialized eye clinic Morozov Hospital. The film introduces the diagnosis and treatments both medical and surgical means of treatment. Ophthalmologist RSFSR, MD, Professor E. N. Kowalewski tells congenital ocular pathology (synchronously). Medicine. Care for the population. Pre-school education. Schooling.